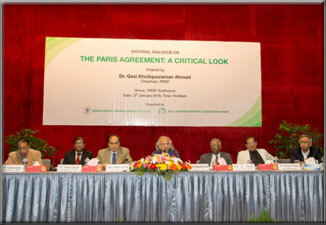 A National Dialogue on “The Paris Agreement: A Critical Look”, jointly organized by Palli Karma-Sahayak Foundation (PKSF) and Bangladesh Unnayan Parishad (BUP), was held on January 05, 2015 at PKSF Bhaban. 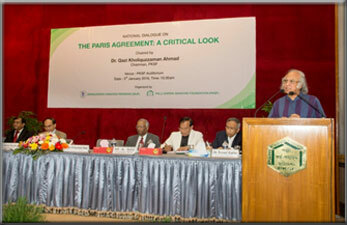 It was chaired by Dr. Qazi Kholiquzzaman Ahmad, Chairman, PKSF and coordinator of Bangladesh Climate Change Negotiating (BCCN) Team. Mr. Md. Abdul Karim, Managing Director, PKSF and Mr. M. A. Jalil, Chairman, BUP made the opening remarks. 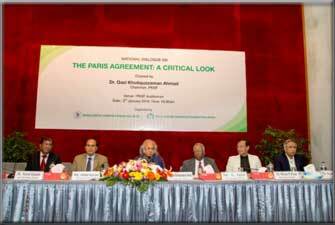 Dr. Ahmad, the Chair, started the discussion, having critically reviewed the major contents of recently signed Paris Agreement on climate change, through his valuable comments. 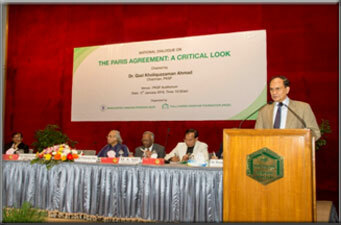 The other discussants, took part as the members of BCCN, were Dr. M. Asaduzzaman, Professorial Fellow, BIDS; Dr. Rezaul Karim, Environment Specialist; Dr. Nurul Quadir, Joint Secretary, Ministry of Environment & Forest; and Dr. Mizan R. Khan, Professor, North-South University. Having a positive look at the agreement as a beginning of new hope, a good discussion was held on adaptation and mitigation measures noted in the agreement, technology transfer & negotiation, climate financing etc. in the context of how Bangladesh is being benefitted there from. PKSF and BUP officials, the officials/representatives from the Government of Bangladesh, PKSF’s Partner Organizations, other development organizations, distinguished guests and representatives from media & newspapers were present in the dialogue.